Outsiders to the field are likely to believe that international relations scholars generally urge robust, if not belligerent, foreign policies and favor a strong and widespread presence of the United States on the world stage. This is quite wrong; realism, the still dominant, if beleaguered, approach to the subject, fully appreciates the dangers and costs of the threat, let alone the use, of military force, and most realists urge that the United States be more restrained than it was under President George W. Bush and even under President Barack Obama. Indeed, many of Donald Trump’s pronouncements along these lines (although not his screeds against immigration and the current trade regime) are crude versions of much realist thinking. Against this background, America Abroad is much to be welcomed. 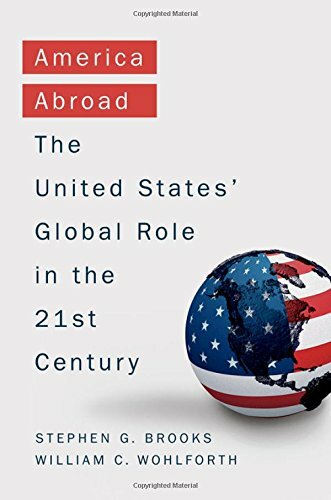 It is a well-argued defense of what the authors call “deep engagement,” by which they mean the maintenance of American alliances and security guarantees around the world, support for international institutions in both the security and economic arenas, and significant provision of international public goods. The logic is clear, the grounding in theories is thorough, and the presentation of evidence, although necessarily plagued by the difficulty of pinning down causation, is fair-minded. As both a contribution to international relations theory and an intervention in current policy debates, Stephen G. Brooks and William C. Wohlforth have made a major contribution. They cogently argue that many of the attacks on deep engagement are misguided because their real target is “deep engagement plus”—that is, the post–September 11 policy of the George W. Bush administration of regime change, most obviously in the invasion of Iraq, but perhaps including Bill Clinton’s policy of “enlargement and engagement” that pushed NATO eastward and Obama’s intervention in Libya. While these policies can be debated on their own terms, Brooks and Wohlforth argue that they are extensions of deep engagement, and one can support the latter while believing that the extensions were misguided. The authors admit, however, that one of the main dangers of deep engagement in an era of great American strength is the temptation to overreach. Some have argued that deep engagement is unwise in the face of a rising China. Drawing with care on the work of others, the authors show that we should not exaggerate. China’s dramatic economic growth disguises many weaknesses, and while it can now challenge the United States in its immediate neighborhood, for the foreseeable future, it cannot be a true peer competitor. Others argue that worldwide involvement is simply too expensive. Here, too, Brooks and Wohlforth disagree, showing that the monetary costs are limited, military spending at these levels is not a significant burden on the economy, and that few alternative policies would save large sums. Perhaps the most powerful argument against deep engagement is that America’s widespread guarantees are not necessary for its security and risk dragging it into wars. Indeed, it is odd that the end of the Cold War has led to more rather than fewer security commitments. Realism—and common sense—would lead us to expect that a diminution of threats would lead to decreases in American commitments. Brooks and Wohlforth argue that this continuing engagement both helps keep the world relatively safe and provides economic benefits for the United States as well as for others. Security interests may be paramount, but they are not the only component of the national interest. Furthermore, they argue, the danger that commitments will pull the United States into armed conflicts it would otherwise shun has been greatly exaggerated. To carry out significant retrenchment would be to move into uncharted waters and to run “the grandest strategic experiment in history” (pp. 198–199). Excellent as it is, the book, of course, gives grounds for criticism. The line between deep engagement and deep engagement plus is not entirely clear, the danger that commitments can create rather than reflect interest is downplayed, and the appropriate scope for nonsecurity interests could have been discussed more. Those who believe that retrenchment is either necessary or would serve the country better are not likely to be persuaded, but they will need to engage with this vigorous defense of what has been the essential American foreign policy for the past 70 years.